Did you know Malaysia is currently the chairman of ASEAN 2015? This piece of news came into my inbox recently with an upcoming Asean Conference on Women In Politics #WIPKL2015 in the note. 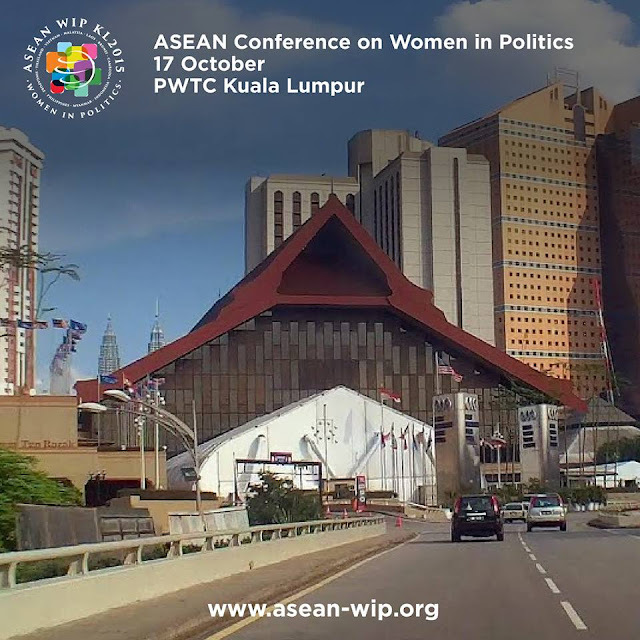 Happening this 16th and 17th October 2015 in Kuala Lumpur, the title for the conference is “ASEAN Conference On Women In Politics: Promoting Representation Through Connectivity and Innovation”. I've been entrusted with a small favour to share this via my site. Participants will comprise of politicians and representatives from ASEAN and Dialogue Partners. WIPKL 2015 will be officiated by The Chairman of ASEAN 2015, Prime Minister of Malaysia, Dato’ Sri Mohd Najib Tun Abdul Razak on the 17th October 2015. With the rice of more and more women in politics worldwide, ASEAN too has seen more empowerment to women leaders, and this is a great sign. As we are nearing to the establishment of the ASEAN Community by the end of this year, the Conference strives to build a political network for ASEAN women who are involved in politics as well as urging for greater participation of women in decision making positions and in the electoral processes through connectivity and innovation. One of the objective of this upcoming Asean Conference on Women In Politics KL (WIPKL) is also to share best practices, challenges and to develop regional commitment in efforts to increase women representation in politics through connectivity and innovation. Recommendations are to ASEAN leaders, political parties and policymakers to work together towards increasing the representation of women in politics through connectivity and innovation. For those interested to join in the #WIPKL2015 sessions, do make yourself available this 17th October 2015 at PWTC Kuala Lumpur as the registration counter opens as early as 7.30am. 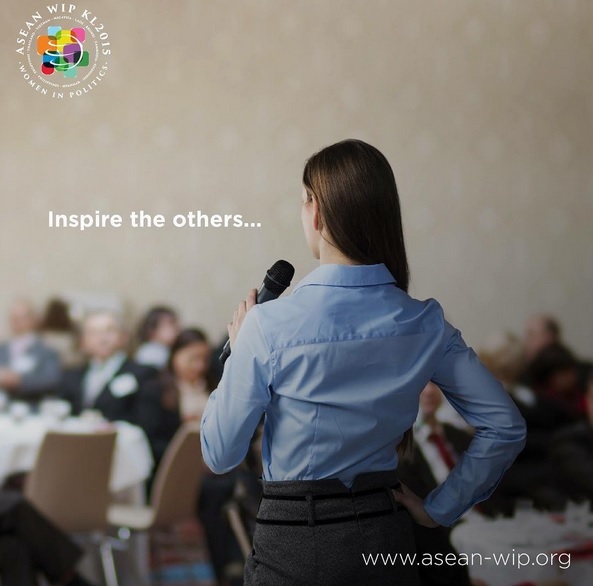 More information can be obtained from the various social media channels as well as their official site at www.asean-wip.org. You can contact theirperson in charge directly too, either Ms. Suhaila Safrizal or Mr. Firdaus Idris at +603-4045 6966. See you there. wow...women also can be so empower !! women must know ur ability . 17 oct i'm full of appointment cant manage to join this time . I don't mind a female leader but I don't wanna be one myself hahaha! Woman power. Woman always strong person and I salute all woman. Thank you for sharing. Thanks for sharing Isaac. Nice information! should be a very inspiring conference..
i wish could join such event. always miss out! Women should be trained to equip themselves in decision making.. A great conference to empower all of us. I guess not only women. lol.The whole world need more positive thinkiing!!! Grrrrr. Politics is like ZZZ to me. It's dirty and unnecessary. Good for those who enjoy it while I watch by the sidelines. Culture is something hard to change. Idealistic vs realistic. Great information. Thanks for sharing. I knew that "Malaysia is currently the chairman of ASEAN 2015". Thanks again. Thanks for sharing this Isaac, this is a great article. Cheers to taking a stand for women; thumbs up! Such inspiring conference it would be for women.I hope that this could reach out to other women as well. Thanks for sharing! Wonder if our beloved RM will be there? She's one heck of a force to reckon with! wow powerful conference. this is so great that it was held in KL, hope it was an empowering time for all the participants. Isaac Tan stand for Asean Conference on Women ;) great ! Not really interested in politics... But it's great for women whom are interested in..
Inspire others. What a nice slogan. This is a great topic for women. Women should be involved more in politics. I saw a post from ELLE, where they photoshopped men out of pictures taken in world-level conferences and it's just sad. Minus men, there are only one or two women at most. Not to say women aren't as qualified in these organizations as men, it could be just because women simply prioritize other things in life. But for those who are interested to pursue these careers, they sometimes don't get enough opportunities or get their big break. It's awesome to see such an empowering event happening in KL. I hope some good came out of it. Sorry its a bit late. I missed out on your blog.